Though mice are skittish and naturally seek out quiet, undisturbed spaces, you can turn them into music fans—if you get them while they're young. Scientists have found that mice who hear music during a narrow window of their development will enjoy it when they've grown up. They'll even behave less anxiously when there's music playing. The brains of mice, like the brains of humans, go through phases while they're growing. During certain windows of time, we're especially ready to learn particular skills (such as seeing with two eyes, keeping our balance, and maybe speaking a language) or develop particular preferences (like a bird imprinting on its mother). Outside of those windows, it may be difficult or impossible to learn the same things. 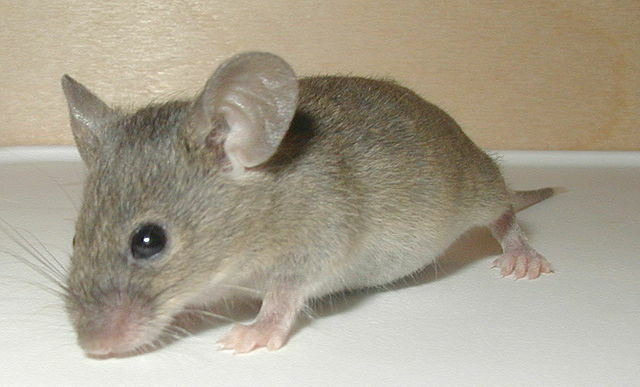 Takao Hensch and his colleagues at Harvard University used music made by humans to study these developmental windows, called "critical periods," in mice. They started with classic mouse-testing setup: a square "arena," 45 centimeters on each side, with shelters holding nesting material in two opposite corners. When left in the arena for a few hours, mice will explore the available shelters, scurrying back and forth between them, and ultimately choose one to settle down and build a nest in. In Hensch's setup, one shelter also held a speaker that was playing music. (The mice heard one of three pieces of music that included the first movements of Beethoven's first and ninth symphonies and a bossa nova tune called "Agua de Beber," the latter of which is now stuck in my head so badly that I wonder if I was trapped in a lab and overexposed to it as a child). Normal adult mice, when dropped into this setup, usually chose to snuggle up in the silent shelter. But Hensch was able to teach some mice to prefer the musical shelter instead. He housed 15-day-old mice in a chamber where one of these pieces of music was playing continuously, for 10 days straight (talk about an earworm). Then he let the mice grow up normally. At 2 months old, he tested the mice in the square arena; one shelter was silent and the other played the music each mouse had heard in its youth. These mice chose the musical shelter at a significantly higher rate than normally raised mice. When mice were exposed to the 10 days of music as adults, though, they still preferred silence afterward. And an earlier study had found that mice exposed to music within their first 10 days of life also choose silence as adults. So, as Hensch reports this week in PNAS, the time around the third week of a mouse's life seems to be a critical window for learning to love music—or, at least, learning not to hate it. But the flexibility, or "plasticity," of a young brain can be recreated in adults. Hensch writes that various "molecular brakes" put a stop to the brain's flexibility in adulthood. These changes prevent neurons from making new connections, for example, or tuck away certain genes in hard-to-reach pockets of a coiled DNA strand. Hensch studied two groups of mice who were missing certain molecular brakes: one thanks to a genetic mutation, and another because of a chemical injection he'd given them. Hensch used these mice, and their young-acting adult brains, to further explore how the animals developed musical preferences. Both types of mice could learn to like music in adulthood, just as other mice did when exposed at a young age. And out of the three pieces of music used in the study, the mice preferred the one they'd been taught over the other two. But it had to be music, not just sounds. Although the mice learned to like Beethoven or Jobim, they could not be taught to appreciate the sound of one note repeated over and over. "It was fascinating to see that music would shape mouse behavior, whereas pure tones would not," Hensch says. "This suggested something special about music was capturing the animal's interest." Of course, mice don't usually grow up hearing human music. But Hensch says his group is also researching "song-like" ultrasonic noises that mice might hear from each other. "Importantly, the same critical period seems to hold there as well," he says. In one final twist to the story, the researchers saw that mice who'd been taught to tolerate music spent more time scurrying across the center of the experimental arena, between the two shelters. This happens to be a classic measurement of anxiety: mice who are more anxious will avoid the dangerous, exposed area. Mice who liked music acted less anxious than others during the experiment, suggesting that the music they heard in the shelter was calming. "This has obvious relevance to music therapy," Hensch says, for both humans and animals. It also provides new clues about the windows of opportunity that exist in our own brains. Events during small spaces of our childhood may determine what we like, what we find familiar, and what tunes will never, ever leave our heads. It is very interesting that the mice in this experiment reacted more to the sound of the music itself, as opposed to specific pure tones. This is interesting because normally mice would be more likely to react to a specific tone, not the music as a whole. The only difference is that the situation I am referring to generally involves some sort of reward (or punishment for that matter). What I find interesting about this study is that it's not about an association between reward and behavior or punishment and behavior: it's overall goal is to see whether or not rats "like" music. My issue with this post is that the evidence does not seem sufficient enough to claim that rats actually "like" music. Although I have no doubt that some rats may enjoy music, the concept is relative. My grandma has owned rats ever since I was a child, but along with rats she owned 2 parakeets. When she would go out, she would leave music on for the parakeets to listen to because they loved music. Her rats happened to be in their cage in the same room as the parakeets. My grandma had never noticed any distress before with her rats when music was on, but she admits that she didn't pay much attention to whether they were distressed or not. At this time, the momma rat was in her cage with her newborn babies. One day, my grandma went out for most of the day with no music on, and came home to her healthy rats. The next day she went out and decided to leave moderately low-volume music on for the parrots, and she came home to find that the mother rat had killed all of her babies. After this incident, my grandma was scared to not only leave music on, but she was worried any sort of continuous sound would cause this behavior to happen again. So my grandma made sure the radio was off and that the television was left off. Even though it wasn't the sound of the television that caused the mother to be distressed and kill her babies, the thought of the background television noise scared her. This is called stimulus generalization, which states that stimuli that are similar (the sound from the television) to the original stimulus (the music from the radio) also elicit the conditioned response (killing of her babies), even though this incident has never been paired with the sound of television.